First…I need to offer a word of thanksgiving to my colleagues in pastoral ministry here at Good Shepherd – Pastor Bob and Pastor Pam. And thanksgiving to the staff of this holy place. They consistently go above and beyond, including working on Christmas and Easter, in order for all of us to have an opportunity to grow in relationship with each other and with our God. And, finally, thanksgiving to the dozens of people who volunteer their time and talent in service during Holy Week and Easter worship. I am forever grateful for the many ways that the risen savior Jesus Christ is alive and working through each one of you. Please join me in showing our appreciation for the work that God is doing through these fine brothers and sisters in Christ. Smith’s claim that the writer of John’s gospel is in search of meaning in Jesus’ death beautifully lifts up one of the challenges that Holy Week and Easter present for those of us who are followers of Jesus in post-resurrection time. We claim to follow someone whom we believe was crucified, died, was buried but is now alive – risen from the dead. And even 2,000 years after the resurrection, the powers of the world around us continue to say that Jesus is dead and that God doesn’t even exist. It’s one of the reasons why I believe so strongly that Good Friday and Easter are the two most significant days in the faith life as Christians. If Good Friday and Easter do not happen, if these events are only a figment of our imagination or a really good idea for a Hollywood blockbuster movie script, then our worship together today – or on any other day of the year for that matter – is really quite pointless. Jesus was just an ordinary dude in the ancient world who was killed by crucifixion. End of story. Who cares. But, I’m also willing to bet that many of those same people – which does include all of us by the way – will have a more difficult time trying to explain the importance of Jesus’ death or what the resurrection actually is or what this ancient story has to do with our life and faith today. If you and I do truly believe that God raised Jesus from the dead and that the cross and tomb are still empty today, then the resurrection is the single most significant event in the history of creation. 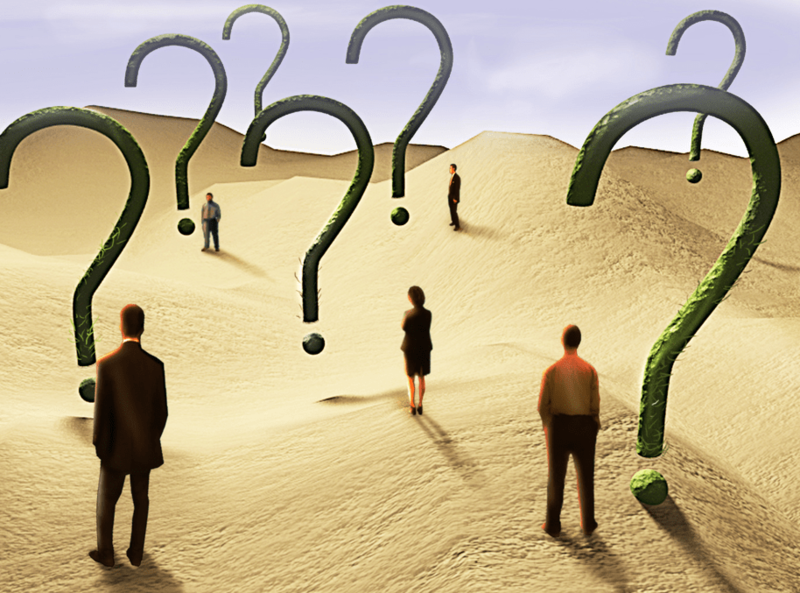 The resurrection of Jesus is difficult to explain and equally difficult for some to believe. But rather than throwing a bunch theological jargon and resurrection theories at you today, let’s simply take a look at the resurrection story again. From the first people to actually witness it as it happened. What does this ancient story of Jesus’ resurrection in the gospel of Saint John and the experiences of the three disciples in this story, have to do with our life of faith today? In a lot of ways, even though around 2,000 years have passed since that first Easter morning, you and I are still among the first witnesses. 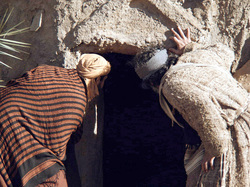 And in so many ways, you and I are just like the 3 disciples who find the tomb empty and can’t quite make sense of it. One who sees the grave clothes neatly folded and believes. One who sees the same thing, yet isn’t quite sure if he believes anything that he has seen. One who in a way is surprised into believing by hearing the sound of her name from someone she didn’t recognize even though she knew him well. The writer of John’s gospel could have written a less complicated story. 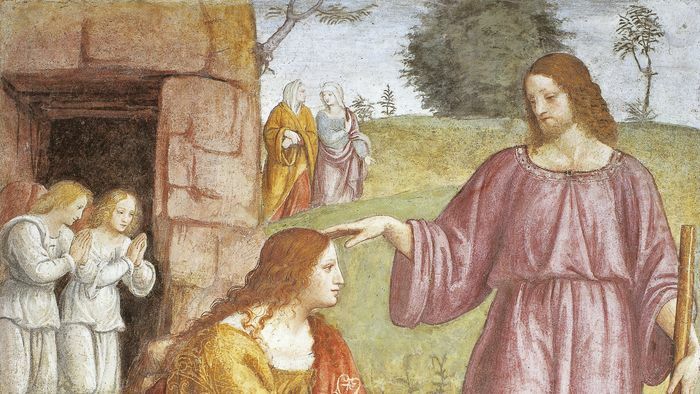 Something like – “Mary Magdalene, Peter and the other disciple went to the tomb. They saw the linen wrappings lying there and believed Jesus had risen from the dead.” Period. End of story. But you and I know that faith and belief in the resurrection in such a simplistic way is not reality for followers of Jesus. Especially as we live in a post-resurrection and ever increasing post-Christian and post-religious world. That’s why I think it’s important for us to see John’s story of the resurrection as one that leaves room. It leaves room for each of us as we sort out our own response to the question “What is Easter anyway?” That’s what’s happening with the three disciples. A young dad walked in on his children playing one afternoon. He thought his kids were just playing house because that was one of their favorite things to do. Much to his surprise, it turned out they were playing church. And they happened to be at the end of the worship service when he walked in. He witnessed the giving and receiving of the benediction in the name of the Father, and of the Son, and of the Holy Spirit. So, brothers and sisters in Christ, whichever way you go out from this sacred time of worship and into the world today, go knowing and believing that Easter is for you. And the next time someone asks you “What is Easter anyway?” Share with them the good news that God has raised Jesus Christ the Savior of the world from the dead and because that happened, God has conquered every death that you and I will ever experience. In the resurrected Christ, there is time after the end, life after death, restoration of what was broken, the brightening of what had gone dark. That’s what Easter is today, tomorrow, and for all eternity. Thanks be to God. Amen. This entry was posted on Sunday, March 27th, 2016 at 11:59 pm	and posted in Recent Sermons. You can follow any responses to this entry through the RSS 2.0 feed.